Cool and cloudy with intermittent squalls of graupel. Light northwest winds. We were able to "will-away" any sunbreaks to preserve the snow. Excellent surfy spring powder. A touch heavier at 8000' and below. None. Where we were, mostly stable snow out of the wind and sun. No sluffing, cracking, collapsing noted - though Mark White's collapsing along the PC ridge is of great interest along that new/old boundary. Weakness 30cm down in storm snow elicited in tests but not an indicator of avalanche conditions where we were today. This layering has been noted (rimed precip particles but not graupel per se) by others but should settle out soon. Two issues here: plenty of cold (though dense) dry snow to move when the sun finally comes out and will be a problem initially before becoming spring diurnal. The other issues revolve around the 5-10cm of unconsolidated wet grains beneath the old snow surface. Other avalanches may come down and transition from dry to wet and gouge into this layering. No free water noted here, but this layering seems to exist up to 9000' on north. Higher? Composite snow profile attached. Fairly consistent 40-45cm from trailhead to 9000'. Very little wind effect. Old wet snow surface has refrozen to a 1cm crust with bonded 3cm of damp snow above. 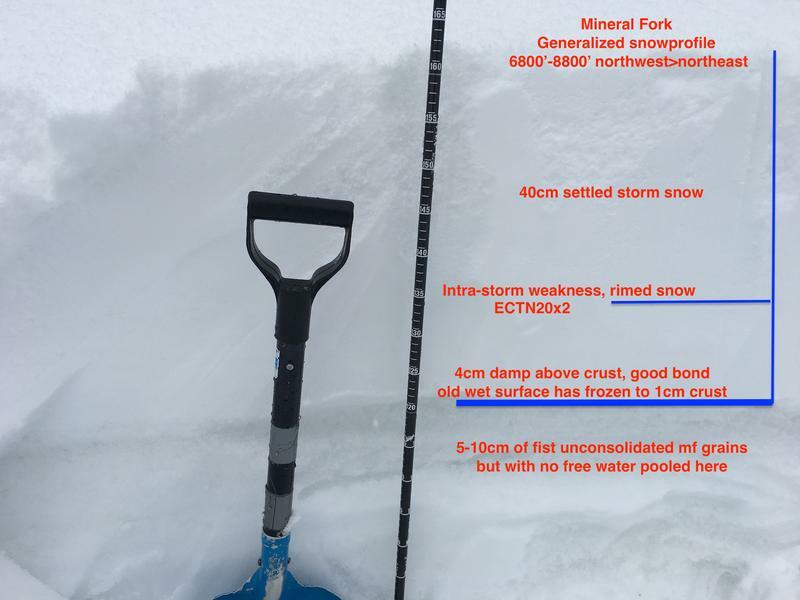 Only weakness is a soon-to-heal layer 10cm up (30cm down) in storm snow. Below the crust the coarse unconsolidated mf grains are fist hardness but have some internal strength and no free water pooling along this layer. Suspect sheer amount of storm snow both allowed for a good bond to old snow surface (no recrystallization noted) but insulated the pack to prevent the unconsolidated grains from locking up. Something to keep an eye on whenever we get the warm-up.